Lisa is amazing! Absolutely recommend her!! I met with Lisa to do my floral consultation and she was so sweet! She helped me creat the most beautiful bouquets for my girls and I! Gave me ideas and ways to stay in my budget while still getting exactly what I want! I’m so happy I hired her and I’m excited to see what she does for me next November! Absolutely recommend her! Thank you so much for the kind words! It was so great to meet you and your Bridesmaids! You will be well taken care of! The big day is 10 months away! Time will fly by! Before you know it, I’ll be presenting you with your beautiful bouquet!! I hope you had a wonderful Christmas with your family! Our flowers were beautiful. Lisa did amazing job making all my ideas come to life for our special day. She is wonderful. Thank you so much!! It was wonderful to work with you and Daryl! It was so much fun pinning the men and seeing how excited Daryl was to get married! Put a smile on my face! I’m so happy you loved my work! Having this review makes all the hard work worth it!! Congratulations on your special day! Lisa was fantastic from start to finish. She asked about my vision first...what I was looking for and what flowers I wanted...then after I told her, she asked me what my budget was. She was able to steer me towards flowers that were similar looks, but in season, to save me money. Her number one priority was that I had what I wanted. My bouquet was gorgeous and all of the flowers we just what I asked for. I absolutely love her and will refer anyone I know to The Enchanted Florist from now on!! Thank you so much! I want my Brides to feel special! Because you all are important to me! I am so thrilled that you loved my creations! I was in awe of how pretty you looked! I hope your wedding was everything that you and your Husband dreamed about! Thank you so much! Lisa was great!!! She was so easy to work with and SUPER sweet!!! I would highly recommend her. My bouquet, boutonnières, and corsages came out BEAUTIFUL!! Can’t thank you enough Lisa!!! Thank you so much for the review, Michele! You’re so sweet! I loved working with you! I hope your day was fun! You were so easy to work with and I can’t thank you enough for hiring me! Lisa is absolutely incredible! She went above and beyond all of my expectations. My flowers were gorgeous and you can tell she truly cares about her work and her brides. I will miss working with her! Thank you so much! It was a joy to work with you! Being there for my Brides is so important! It’s a process to finalize all the details and we worked together so well together! I will truly miss our emails! Congratulations, Jessica, you were a gorgeous Bride!!! Lisa was amazing! The arbor, the wreaths everything was fantastic. I wasn't expecting petals on the aisle for the Ceremony but she added that little touch which made it all the more special. She brought our vision to life, we just showed her pictures of how we wanted our flowers to be and she went above and beyond to help us pick our flowers that's still in our budget. She is just wonderful and sweet, answers all our inquiries in a timely manner. If I ever need to do flower arrangements again the future I would go to her in a heart beat. Love love her work!! Thank you so much for the awesome review! It was a joy working with you both!! You both were equally involved with the planning phase and equally excited! I’m so happy you loved the aisle! I’m still in awe of your dress! You were gorgeous! Thank you for letting me part of your special day!! Lisa is amazing! So talented. All of the flowers for my daughters wedding were absolutely gorgeous! She has such a great vision and so much creativity. My daughter wasn’t exactly sure what she wanted but after meeting with Lisa to discuss ideas she came up with a beautiful plan! Thank you Lisa..... the flowers pulled everything together and the wedding was fantastic! Thank you so much for the review! And thank you for posting the photos!!! My favorite is still the driftwood!! Those tables were so fun to create! Thank you for trusting me with such an important occasion! It was such a joy to work with you and Megan!! Congratulations to you all! Lisa was amazing to work with! She was super responsive, is very passionate about her work, and showed up to the venue with beautiful floral arrangements that blew us away. We had a last minute day-of snafu when her wholesaler provided a sub-par Lei, but she went above and beyond and drove across town to find the perfect Lei for us at the last second without even asking. Truly amazing!!! I can't thank you enough for such a wonderful review!!! It was so great working you and Matt!!! I hope your day was everything you both had hoped for and more!!! I have the best team! And I couldn't be more proud of their efforts to make sure you both were happy!! Congratulations!! There aren’t enough stars in the world to give Lisa the rating she deserves! I’ll start with saying that Lisa has the best personality and is truly a delight to work with. She is so much fun and energetic and I loved my interactions with her. After telling her my theme and what I was looking for, she made many suggestions and not knowing much about flowers I trusted her thoughts and knew she would make everything perfect. The image I had created in my head of what to expect was nothing compared to what I got. Lisa went above and beyond what I imagined so much that when I saw my bouquet I teared up and couldn’t believe those were my flowers to hold and walk down the isle with. All of the flowers at my wedding were absolutely stunning and took my breath away. 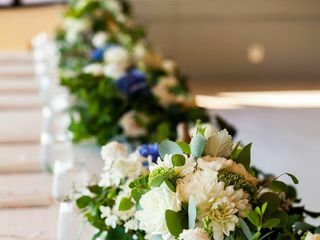 When I woke up the next morning I really took a hard look at all of the flowers- my centerpieces, the backdrop, the ones used for the ceremony, and at that moment I truly broke down into tears. Lisa put so much time into putting these flowers together. They were each perfectly placed down to the last detail and I could really feel how much Lisa cared for me and for helping to make my day so special. Lisa is a wonderful person and truly cares so much about her work and it was an honor to have her as my florist. Thank you so very much! You tugged at my heart strings when you tried not to cry when I presented your bouquet to you! The love you have for you family and new Husband makes feel so very proud to have played a small part in your special day! I can’t thank you enough for choosing me as your Florist! Brenna!! Thank you so much! It was so great working with you! You had a vision and I loved creating it for you! I stayed long enough to catch a glimpse of you in your dress! Simply gorgeous! Congratulations! Hi Pam!!! Thank you very much for this kind review!! I do try, very hard, to make sure my Bride is smiling and excited when she sees her flowers! I can't wait for your wedding! Lisa was AMAZING!!! i was so honored to have her do my floral for my wedding. She truly listened to my dreams and made it all come true. Her prices were reasonable and I was even able to work in more floral for other things :) I cannot say enough great things about her!!! You will not be disappointed! Katie, thank you very much! It was an honor to work with you! You were organized and knew what you wanted! Thank you for trusting me to give you your vision!!! Your excitement for your bouquet totally made my day!!!! Where do I begin?! Honestly I would give Lisa 10 stars out of five that's how amazing she is! I came across Lisa and her work at an open house at my venue and instantly LOVED her work and LOVED her! She was the ONLY florist to tell me that we could make my budget work to fit my vision. Lisa has the best heart, she cares more about the couple than she does about the business side. She was by my side throughout my long wedding planning process always giving me words of encouragement and never getting upset when I changed my mind a thousand times! 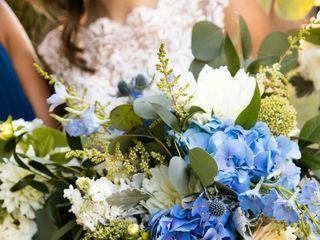 On the wedding day, Lisa brought her whole team with her to make sure everything was set up to how I wanted it and it was truly STUNNING everything I wanted and more! Her talent is amazing and impeccable! I am honestly so sad that my wedding planning is done and I won't be interacting with Lisa through emails anymore. Lisa is the best of the best and you will be so happy with picking her as your florist! I don’t have waterproof mascara on! I can’t thank you enough for such a kind review!! I loved every minute of our emails and chats!! You had a vision and every Bride deserves to have that vision! And you were GORGEOUS! I am so going to miss you!! Hugs and a huge Congratulations! Lisa was very professional, personable and has wonderful creative ideas. The flowers were a major part of my daughter's beautiful wedding! Thank you very much for the kind words! It was a honor to be a small part of Emma's big day! It was great to work with you all to make their day special! Lisa was AMAZING! She created exactly what I wanted for my wedding. One of my favorite parts of my wedding was my flowers and many others commented on them as well. She is wonderful and I will always refer others to her! Thank you so very much for the kind words! Tho, I didn't get to see you in your dress, I'm sure you were stunning!! It was an honor to play a part in making your day beautiful! Congratulations to you both!!! My wedding wouldn't have been the same without the amazing flowers provided by The Enchanted Florist. I cannot thank you enough for your quality work & attention to detail! Thank you! Thank you very much for the kind words, Lindsey! I was honored to play a small part in making your day special!! Thank you, so much for the kind words, Deena! You had a beautiful vision and I’m so happy that i was a part of your special day! I do have to say, that tractor was the coolest backdrop ever! Congratulations!! Lisa was amazing and so easy to work with - We couldn't have asked for a better florist! She listened to what we wanted and made suggestions to keep the costs low which we really appreciated. She made the process of picking flowers fun and easy so we never once felt stressed. 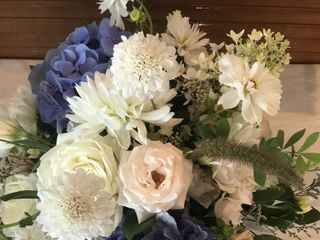 We had many people comment during the reception how stunning and beautiful the flower arch, table arrangements, and bouquets were. I just can't say enough good things about Lisa and her work!! Please look no further and book her for your wedding!! Mikala, Thank you very much!!!! And the photos are gorgeous!! You and the girls are glowing! I do try, really hard, to give my brides the vision that they have dreamed of for their flowers! I can't thank you enough for such kind words! Where to start!? Lisa is absolutely AMAZING!! I don’t think I can say enough good things about her!! Not only is she one of the sweetest people you will ever meet (I actually invited her to my wedding bc I wanted her there to celebrate with us! Yes, she is that amazing) but she managed to make ALL of my visions for my flowers and my bouquets come to life. Lisa works closely with you to make sure you have exactly the look you want! She replies very quickly to questions which makes the communication with her, effortless! If you know exactly the stems/flowers you want- she’ll make it happen. If you have a desired look but don’t want to pay an arm and a leg for a flower that might be out of season, Lisa has the expertise to find a flower that is similar and that will give the same look for a fraction of the price to help you save some serious cash! 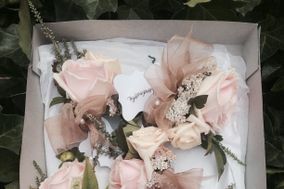 You will NOT find a florist that does this type of impeccable work for a better price. This I can promise you! AND.... she delivers the flowers/centerpieces/ bouquets herself to your venue to help set them up to make sure everything is perfect!! Look no further, Lisa is your gal! You will not be disappointed!!!! Oh my , sweet Katie!! I can't thank you enough for such a glowing review! I do strive to make the whole process, of creating your dream bouquets as enjoyable and fun for the Bride as it is for me! Seeing your face light up when I presented you your bouquet, will forever be in my heart!!! Lisa is awesome!! She is super nice and easy to work with! She worked her magic and brought to life what I had pictured for my orchid, stephanotis & rose bouquet at a reasonable price. She is knowledgeable and provided ideas as well. Thank you so much Lisa!! ?? Thank you so much!!! You were absolutely gorgeous, my dear!!!! I hope you and the family have a wonderful Christmas!!! Thank you very, very much, Kara!!! You were simply stunning on your Wedding day! I won't be forgetting that arbor anytime soon!! Please, tell your Mom hello for me! Have a wonderful Thanksgiving as Mr. & Mrs! What a sweet, homey, and friendly florist! She has an amazing eye for design and will go above and beyond to treat you like family. Highly recommend...very affordable and lovely! Thank you for the kind words! I want my Brides to feel at home and relax! Weddings are stressful and if I can take that stress away, I'm happy! 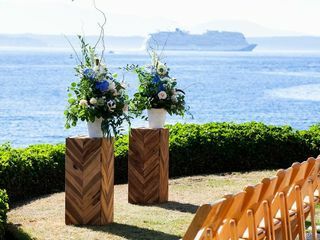 Can't wait to create your flowers for your wedding! The most crucial part to smooth wedding planning are your vendors. They can make or break your planning experience. 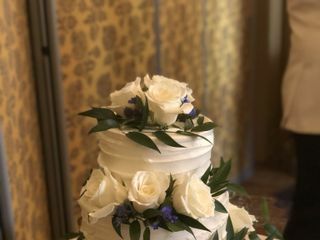 Working with Lisa - The Enchanted Florist was not only a breeze and completely stress free, it was so fun and truly a pleasure. Not all vendors are easy to work with, but Lisa was incredibly helpful and informative. She is brilliant and so talented, she turned my vision into reality. It was like she read my mind. You don't even have to know what flowers are technically called because she does and she brings to life what you've dreamt up in your mind. I was in awe when I saw my floral arrangements. They literally took my breath away. Beyond being a talented expert in her field of being a florist, she went above and was there for me through some of the most difficult times in my life which happened to hit during my wedding planning. I can't express how grateful and pleased I am with having Lisa as my florist. She is the sweetest and most caring person and vendor I had the pleasure of working with. Definitely was the highlight of my wedding. Her work is simply amazing, everyone at our wedding was impressed! Joanna, thank you so much! It was a dream to work with you! You knew the look that you desired and I had a fabulous time sourcing the perfect flowers for you! The arbor has never looked so pretty!!! I don't usually stay for the ceremony but was overjoyed to see you and your Dad crest the hill!! Goosebump moment!!! Your family and friends were a dream to work with, helpful and so friendly! You hired me as your florist and I will give 110% from first meet to the the big day!!! Weddings are stressful! I was honored to be there when you needed a shoulder! May the years ahead bring you and Andrew much love and happiness!!! 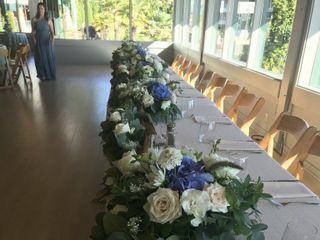 Beautiful flowers and arrangements, she even helped set up our chair and table decorations, and pinned the all the guys. I received everything that I asked for even though I had no knowledge about flowers or even specifics to give her, she understood my vision and created it beautifully!! Jen, thank you very much! I'm so happy that I achieved the vision you wanted! You all looked amazing!! 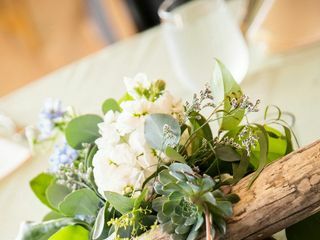 It was so fun creating your bouquets! Thank you for the kind review!! I couldn’t be happier with how amazing my wedding flowers turned out, Lisa truly is an amazing artist, and one of a kind. Lisa took the time to listen to what I wanted (since it mostly was all ideas in my head) and was able to create the perfect wedding bouquet, floral crown, dog wreath, and arrangement for our teepee. They were seriously the most beautiful arrangements I have ever seen, you seriously will not be disappointed in Lisa’s work. Thank you so much, Autumn!!! So often I'm jotting down little notes or comments that you girls mention and it's these little pieces that are key to what you're trying to convey! You were the prettiest Boho Bride, ever!! !